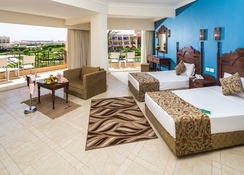 Jasmine Palace Resort is an all-inclusive beachfront property located in Hurghada. The resort enjoys a secluded spot, nestled among magnificent scenery and lush gardens. Offering a private beach access and an outdoor pool, this is one of the finest five star properties offering all-inclusive, local drinks included accommodation. Guests can feel at home with well-appointed, air conditioned rooms furnished with flat-screen TV, balcony with sea or garden views, en-suite bathrooms and a minibar. Free private parking is available. There are five exquisite restaurants that serve an array of delicious national and international cuisines. There are six delightful bars serving beverages and refreshments in a relaxed ambience. 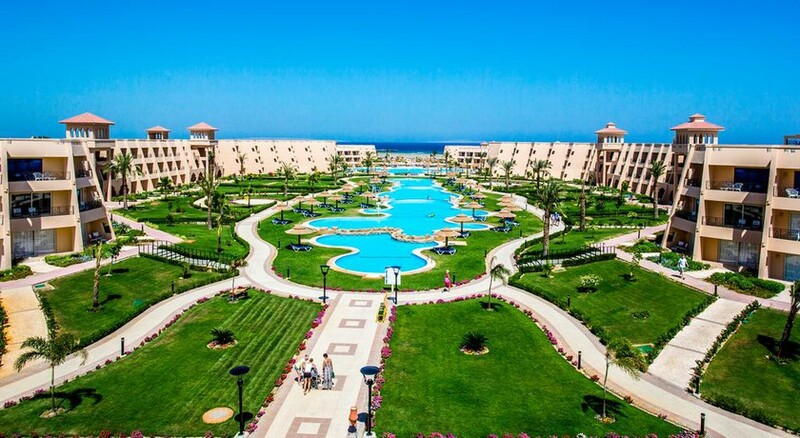 Jasmine Palace Resort is an all-inclusive beachfront property located in Hurghada just 20.4km from New Marina and 18.1km from Giftun Island. The Senzo Mall is 4km and the Sand City Hurghada is 4.2km. Hurghada International Airport is 16.6km from the property. 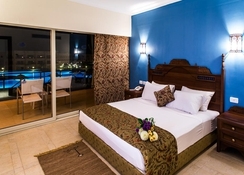 Jasmine Palace Resort offers 690 rooms in three different categories, some overlooking the sea, garden or the pool. The Standard Double or Twin Rooms with Garden View rooms all feature air-conditioning, a mini-bar, tile/marble floor, a flat-screen TV, en-suite bathroom fitted with a bath/shower and a mini-bar. The Triple air conditioned room features a tile/marble floor, mini-bar and Garden Views. Jasmine Palace Resort’s five exquisite restaurants serve an array of delicious national and international cuisines. Relish lip smacking cuisine prepared by expert chefs. There are six delightful bars serving beverages and refreshments in a relaxed ambience. 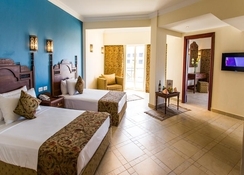 Jasmine Palace Resort offers plenty of activities for guests to relax. There are an outdoor heated pool and private beach access with pool/beach chairs where guests can soak up the sun. There is a spa that offers relaxing massages and therapies. The hotel offers facilities for sports like squash, table tennis, darts and a games room. Activities like snorkelling, diving, windsurfing and billiards can be availed at extra charge. For the tiny tots there is playground, indoor play area, outdoor play equipment and books/DVD and music. Very friendly helpful staff thoughout resort rooms need an update and no WiFi only hotel I have had to pay for WiFi so you must buy at reception but better to buy from shops and get sim instead to use around resort . Animation team very funny and friendly and shows good but only problem is entertainment was in marque outside at Christmas time they made it extra special but felt chilly in evening. Excellent 2 week holiday over Xmas period. Food was local in origin but we all really enjoyed it. Room a little dated but clean and sizeable. WIFI only available in reception and very poor connectivity. Needs investment. Beach environment wonderful and safe. Plenty of activities on offer. This is a four start hotel now and was once a 5 star when it opened many years ago..having said that we as a family and friends enjoyed our stay there and would consider staying again in the near future. The location is OK, a bit outwards and remote, there are local shops but you'd need a taxi to go to most places. Facilities are OK, used the spa and had great treatments like the Turkish bath and Egyptian massage. The pools are well maintained but they keep running out of sun beds! The food varies through the day though they do serve the same food on a daily basis. Bring your own beaker/glasses/cups as they keep running out of drinking glasses. Staff were polite and welcoming, entertainment in the evening was quite good and gets everyone involved. Overall its a good all round hotel and would recommend to all. Nice and pleasant stay in late November.Nice food, warm pool, clean water, lovely animation team. 1/2 of the resort was still a building site, although what was finished was nice but needs updating. Really quite resort, Didn't really enjoy the food. Mcdonald was only a short taxi ride away though.